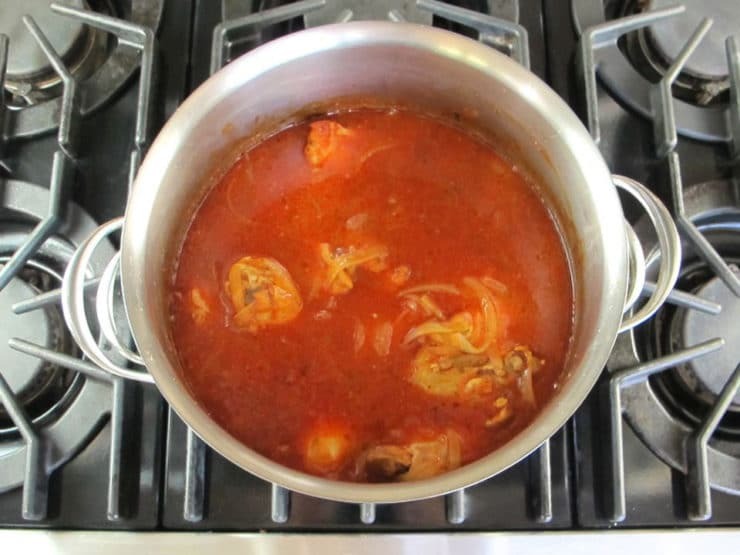 Michael Berkowits’ Kosher Chicken Paprikash – Learn to make kosher Chicken Paprikash. Dairy free and delicious. Serve over homemade nokedli, rice, potatoes or any of your favorite starches. Last week I visited with my friend, Michael Berkowits, a retired chef and Holocaust survivor living here in Southern California. I first met Michael last year through my friend and fellow food writer Jackie Dodd, who blogs at DomesticFits.com and TheBeeroness.com. At that time, she ran a social work program for local seniors (she has since gone on to write a fabulous cookbook!). Ever since Jackie introduced us, Michael and I have stayed in touch. 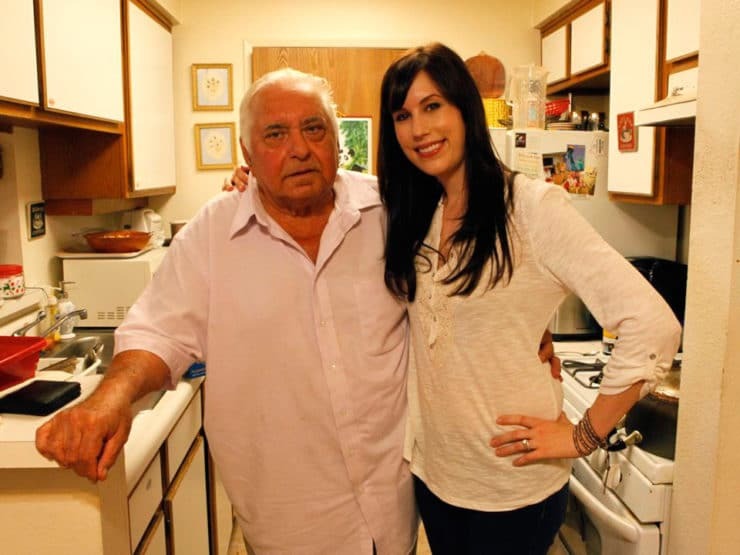 When we first met, he shared his incredible life story with me, which I wrote about in this post: Michael Berkowits’ Tiramisu. If you haven’t had a chance to read his story yet, please do. Have tissues handy. He is a wonderful person who has been through so much, yet he remains positive and full of life. I feel so blessed to know him. Michael has been wanting to teach me his recipe for Kosher Chicken Paprikash, so last Wednesday I headed over to his place for a cooking lesson. My assistant Ashley came along for the ride to snap pics. Michael walked us through the process of making the recipe, step-by-step. Michael became familiar with this dish during his childhood. He grew up in Transylvania (what is now the central part of Romania, and was once part of Hungary). Because of his background, many of his family recipes have a Hungarian influence. Michael’s mother, who sadly was lost in the Holocaust, cooked this dish for him when he was a young boy. After moving to Israel and later America, Michael became a chef. Though he cooks a variety of foods from around the world, the Hungarian-inspired dishes hold a special place in his heart. 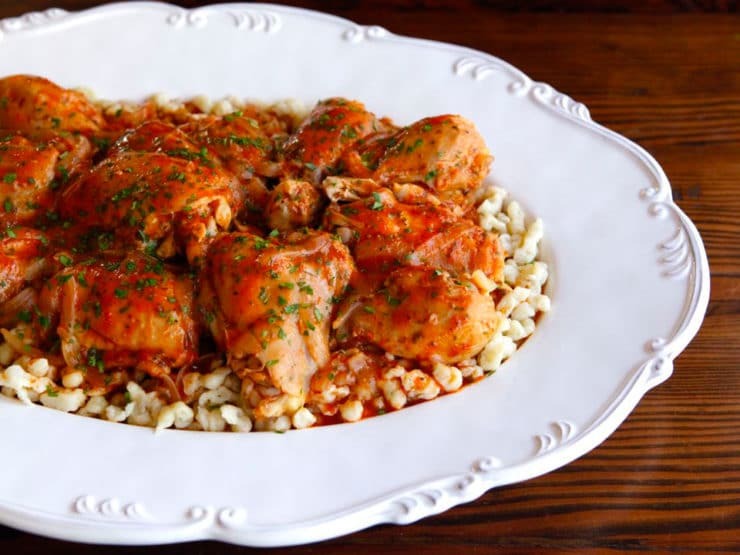 This chicken paprikash might be slightly different than the paprikash you’re familiar with. 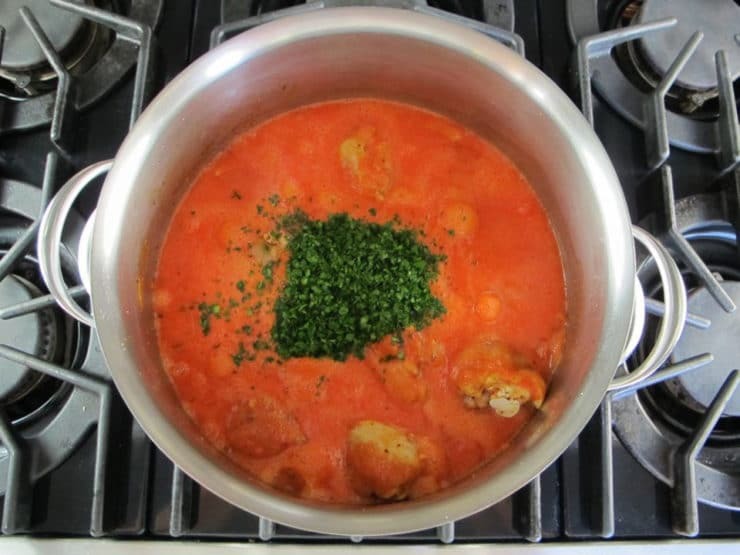 Many Hungarian paprikash recipes contain sour cream, which adds creaminess to the sauce. Because Michael grew up kosher and milk was never mixed with meat, this recipe contains no dairy. The sauce is rich and thick, but not creamy. Nowadays kosher cooks can substitute dairy-free sour cream in a dish like this, but back then soy-based dairy substitutes didn’t exist. If you aren’t worried about keeping it kosher, you can stir in 1/2 cup sour cream (or more to taste) at the end of cooking. That said, I honestly don’t feel like the dish needs it. I didn’t miss the sour cream here at all. This chicken paprikash is totally delicious as-is. 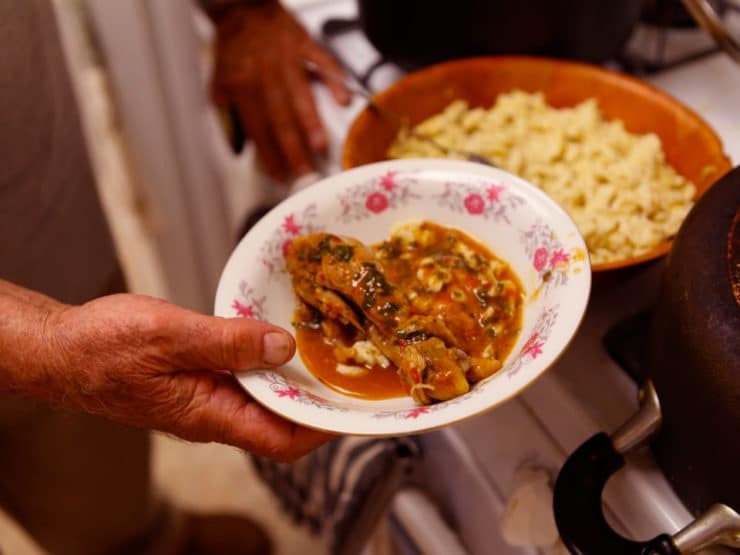 Traditionally the dish is served over what Michael called nokeli – in some regions it is known as nokedli or spätzle. These simple little egg noodle dumplings couldn’t be easier to make. I’ve provided instructions here: Nokedli – Spätzle. If you don’t want to go to the trouble of making the dumplings (or if you’re gluten free), you can easily sub mashed potatoes, rice, or even quinoa. The dish pairs well with a starch, but you could also serve it with a green vegetable or mashed cauliflower to make it low carb. It’s a versatile entree. After we cooked, we ate together and chatted about Michael’s new hobby. He’s recently started organizing large dinners for the residents of his retirement complex. Everybody pitches in money for the ingredients, then Michael cooks the food. They’ve been doing it twice a month, but the residents are enjoying it so much they’ve asked him to do it every week! Not surprising, Michael’s food is really amazing. I’ve broken down Michael’s instructions to create the Kosher Chicken Paprikash recipe below. It’s a pretty simple dish to make. This is a hearty but healthy cold weather dish, a super comforting meal. Thanks to Michael for sharing! 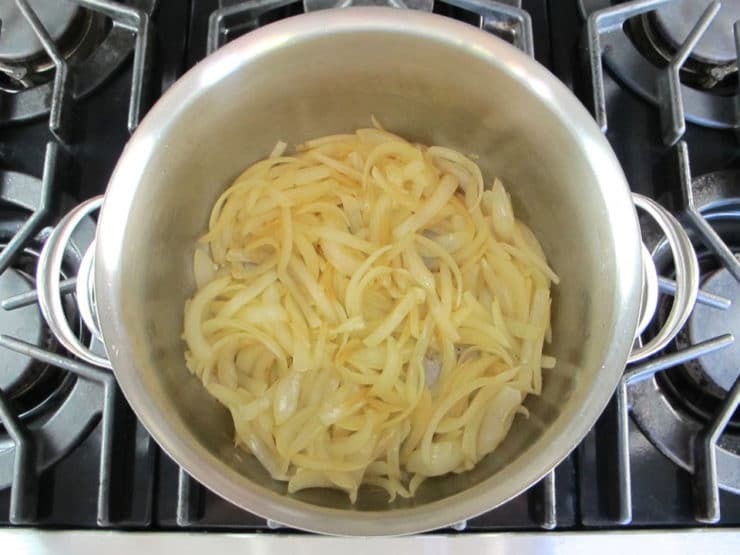 To learn to make Nokedli – Spätzle, click here. Nutrition information is for chicken only. Before he begins, Michael likes to take the skin off of the chicken, so the dish doesn't contain as much fat. You can leave the skin on if you prefer. 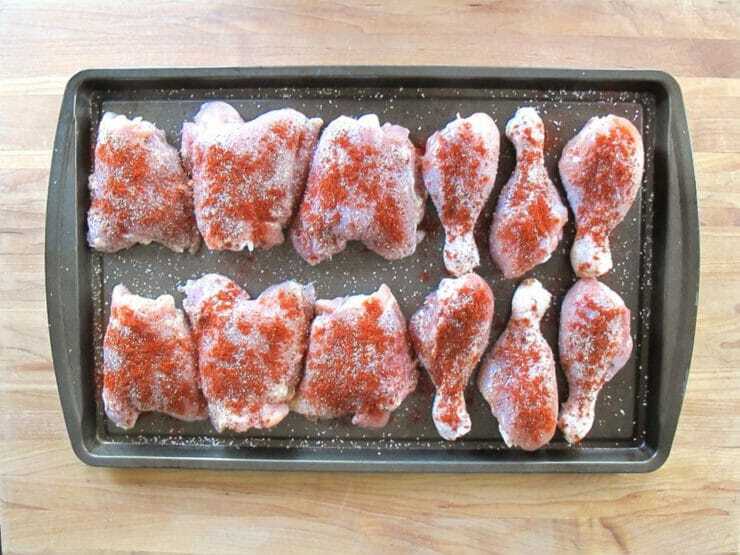 Sprinkle the chicken pieces generously with paprika, salt and pepper (if using kosher chicken, salt lightly). 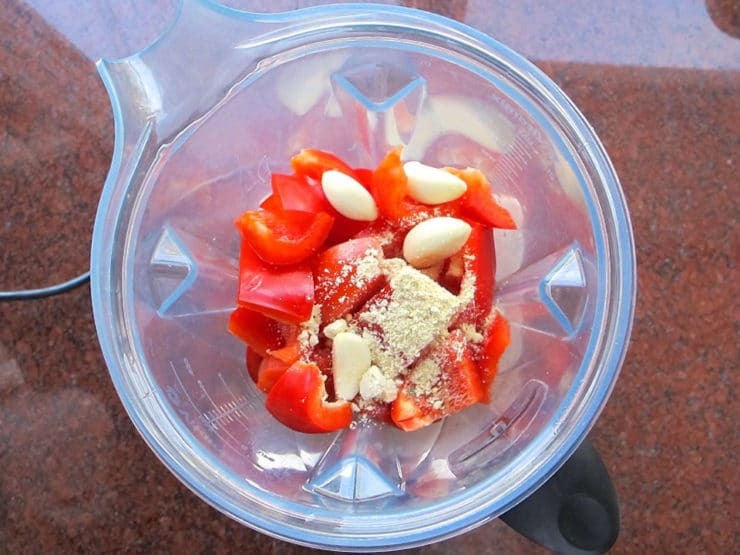 Place the bell peppers, tomatoes, chicken consomme powder and garlic into a blender. Blend to form a sauce. In a large pot, heat olive oil over medium. Saute the onion slices in olive oil until tender. Once the onions have softened and are starting to caramelize, add the seasoned chicken pieces to the pot. Saute for a few minutes. Pour the blended sauce over the top of the chicken pieces. Add water till the sauce just covers the chicken. Sprinkle with 3 tbsp of the chopped parsley, season with salt and pepper to taste (I used about 1 1/4 tsp of each), and bring to a boil. Reduce heat to a low simmer. Cover the pot, vented slightly. Cook the chicken for about 1 hour or to desired tenderness. The longer it simmers the more tender it becomes. When the chicken is finished cooking, adjust salt and pepper seasoning to taste. Mix together 2 tbsp cornstarch with 3 tbsp of cold water. Gently stir the corn starch mixture into the chicken sauce and simmer for a minute or two to thicken. Serve chicken and sauce over warm nokedli - spätzle or the starch of your choice. Mashed potatoes, egg noodles and rice will also work well. Sprinkle with remaining 1 tbsp chopped parsley to garnish (optional). Best chicken paprikash dish ever! 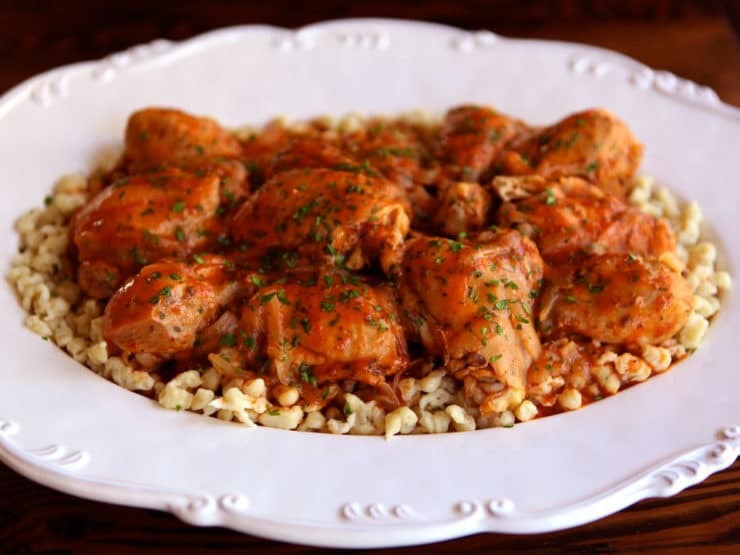 My mother is Hungerian and I love all of her cooking that was passed down from my grandma but this chicken paprikash is really a one of a kind, Ive been making this dish exactly as Michael says and my kids, wife and my mom go nuts over it! Thanks Tori. How can I print this recipe with ingredients and instructions, without the pictures? Hi Sheila, Tori’s assistant Ashley here. At the beginning of each recipe, just before the list of ingredients, there is a red “Print Recipe” button. Click on that and it will take you to a page with just the ingredients and recipe method instructions. How long to cook this if making with whole chicken cut into 1/8? Thank you. 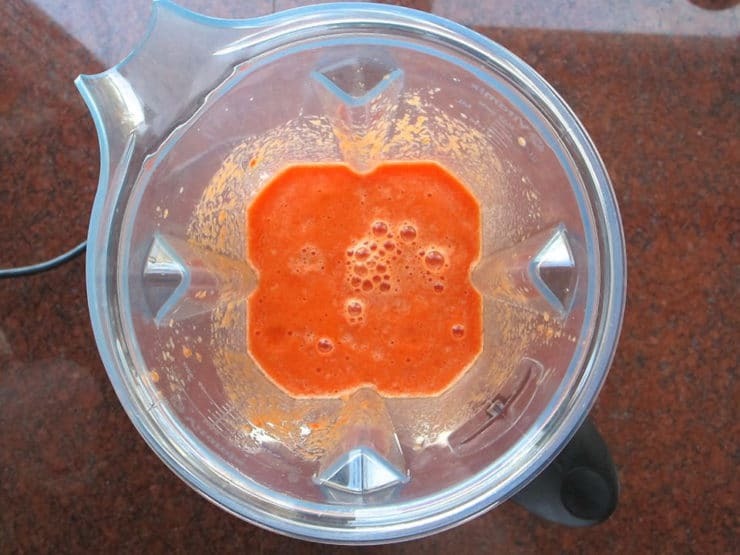 Do you need blanch the tomatoes and/or red peppers to take the skin off before blending? 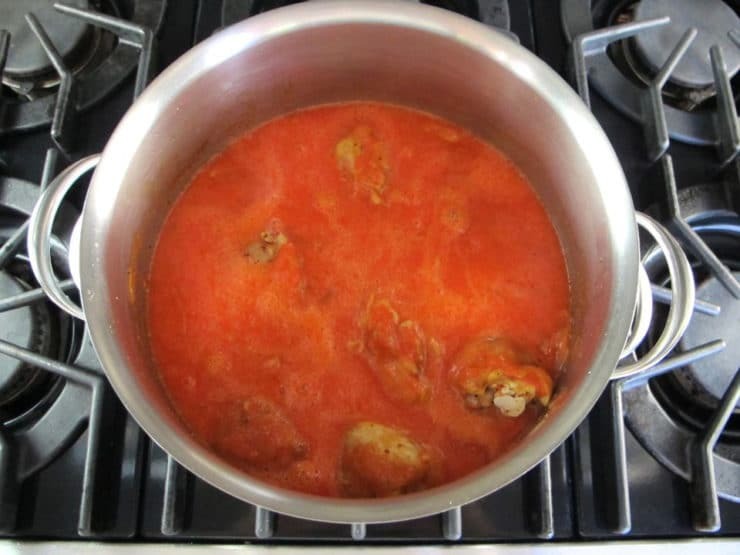 Many of the tomato-based sauce recipes call for blanching and removing the skins because cooked tomato skins could get tough and ruin the texture of the sauce. So I’m wondering if that’s necessary here? Hi Holly– while you certainly can blanch the tomatoes and peppers (it won’t hurt), Michael’s original recipe doesn’t call for that. I enjoyed the sauce, and did not remove the skins prior to cooking. I made this dish and your classic latkes last night for the second night of Hanukkah, and they were absolutely wonderful. Your step by step instructions made everything simple. I’m excited to add the chicken paprikash to my repertoire. Thank you! It was delicious! I even liked it better on day 2 after I took the meat off the bone and cooked the scraps until the sauce was even thicker! Thank you for this recipe! We made this tonight and it was excellent. Very easy to follow. thank you for posting such a delicious recipe ! though we don’t eat kosher, but this recipe is perfect for my family as my baby can’t have dairy. prayers and love from pakistan. It turned our perfect. I served cucumber salad with it. Happy birthday boy. Thanks, Tori for another good one!!! I have this cooking right now. I am making it for my Hungarian born husband’s birthday. I made it exactly, except I added a couple of breasts too. It smells wonderful. We are excited!!! My great grandparents were from Budapest, Hungary, and they handed down their recipe until it reached me. Although the spaetle’s are the same, the recipe certainly isn’t! There are no peppers or tomatoes and it’s not a red gravy/sauce, it’s a cream sauce made with sour cream and chicken broth. Just goes to show you how the different areas of Hungary/Romania can have the same dish but make it so differently. God love this man for surviving that horror and coming out on top. We should all be living in peace, respect all mankind! Thank you Tory to share all the great recipes! Thanks for the post, much like my grandmothers and no we did not have any sour cream with ours either. Paprika is the star. In Memoriam. I will try this recipe very soon! Who doesn’t love a good paprikash. I will even make sure there isn’t sour cream in the house when I make this. Okay, maybe not go that far. Thanks for posting this Tori Avey. Will have to try it tomorrow for our Shabbat Chicken dinner. Have never been able to recreate a version that compares to the one my husbands grandmother made. She never gave it to my Mother in Law. And my family did not grow up on the dish as we were not Hungarian. Thank you for sharing the story and his recipe. Give him a hug for me should you see him. I truly hope no one has to suffer in that way ever again. I am glad he got to meet the man who gave him good advice to save his life. As usual I love your blog girl! Thanks for sharing Mr.Berkowitz painful experiences, so many similar horrors I heard,my mom was selected by that animal also,never saw her parents and sister w/ her baby again.It effected my life tremendously, we should never forget! Looks great, being Hungarian countless time I make this favorite dish for my children, I do not use sour cream, and I do not use parsley in mine. Hungarian paprika is the secret,which I have on hand always! bringing it from Hungary/home made/ who ever makes this delicious dish, enjoy it! I make this with chunks of tomato, I don’t blend the sasuce but let it cook with the other ingredients without the chicken consomme. It gives a lovely broth as well. My background is Budapest Hungarian and no sour cream ever entered my mom’s paprikas. We always had it with hand cut nokedli as mentioned by others. I made this last night, as directed with just a dash of smoked paprika for fun. Absolutely delicious. Thank you! My grandmother used to make paprikash with the sour cream and LOVE the recipe that is dairy free. She also did hers with chicken legs or thighs. What about breast instead? Would it get tough/stringy during the cooking process? I’ve never been one to eat meat off the bone– hmm.. what about boneless thighs? Breast on the bone would work well, but the cooking time should be reduced to 45 minutes so it doesn’t become dry. Boneless thighs would probably work too, but the sauce won’t be as rich (the bones give a nice depth to the flavor) and the meat will cook much faster without bones- it may only take 20-30 minutes, which means the sauce won’t have as much time to reduce. 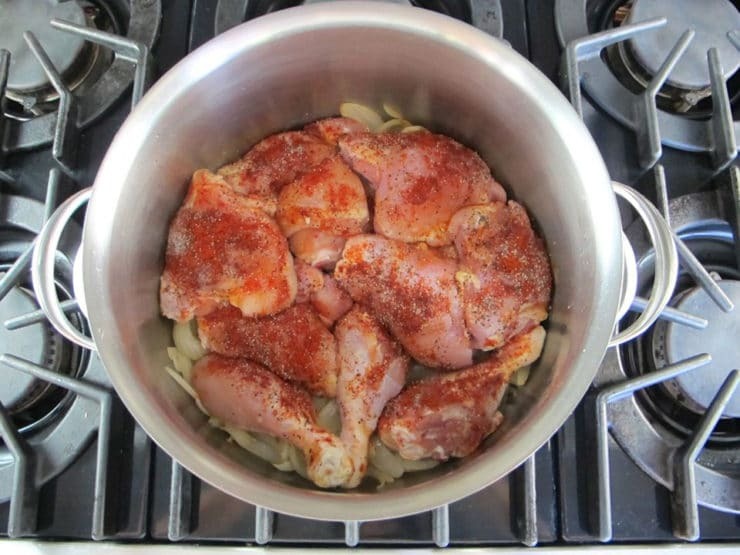 Maybe reduce the sauce without chicken for 30 minutes, then add the boneless thighs until cooked through. That’s just a guess, I haven’t tested it this way. Enjoy! Thank you Tory for all your recipes and the accompanying background information. I made chicken catch me last week. It was a great hit. Tonight, we will be dining on chicken paprikash and marble cake. You’re welcome Lori! Happy you’re here. It is so tasty you will beg for MORE! Made this tonight for dinner (my family is from Budapest so I’m always up for Hungarian food). It was amazing. I added some caraway seeds as well. Highly, highly recommend it. Can’t wait to try this. I haven’t made chicken paprikash in years. My the Lord’s blessings be on you both! Shalom. My father’s family is of Hungarian Jewish descent, and we have a very similar recipe for chicken paprikash! My mother always serves it over rice, but my grandmother used to make it with nokedli. It’s also really wonderful for matzo balls during Passover. Another thing my grandmother did was making “weiner paprikash” with hotdogs. Very 1970s. I made this last night. My husband was just so crestfallen when there wasn’t any left for lunch today. Will make again… and again and again! Great to hear that Jeniece! Hurrah! I did not grow up kosher, but I have an aversion to mixing dairy and meat … and this paprikash looks and sounds delicious.